It was quite the dinner I was invited to! Headed to my Pastor’s house with two bottles of wine…hmmmm. I had no idea what was going to be served…all I was told was to bring two bottles of wine, so I decided to take the Passaggio 2012 Pinot Grigio and the 2012 Rose Colored Glasses. I figured, if anything, we could at least open one of them before dinner. When I arrived at the house and walked up to the door, I could smell dinner. Wow – I could tell we were in for something tasty!!! Invited in, I noticed some great dishes still being prepared in the kitchen. My neighbor…she was my ride…started helping. She began to cut up the strawberries for the dessert. And, of course, I opened the Rose Colored Glasses and poured everyone a glass as they arrived. The 6 of us stood around in the kitchen watching the final touches of the dinner preparation. My pastor tried to shoo us out of the kitchen, but we rebelled and had a great time sharing memories of family kitchen gatherings and stories of grandmas showing generations how to cook…it was such a good feeling to just relax as we shared great company and great wine while great food was cooking. We all headed to the dining room where the table was set to perfection. The table-cloth, the cloth napkins, the dishes…everything was beautiful! The main course was Danish meatballs, also known as frikadeller- oh my!!! The spinach salad was wonderful and the pickled red cabbage side dish was scrumptious. And of course, the dessert….Fresh strawberries over sponge cake with ganache chocolate sauce and whipped cream. We drank the Rose Colored Glasses with dinner. There was a red wine sitting silently on the side table. 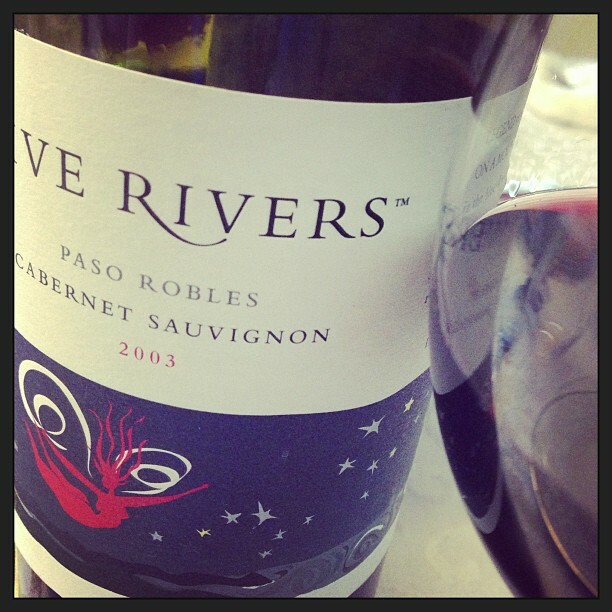 With very little prompting, we opened what turned out to be a Five Rivers 2003 Paso Robles Cabernet Sauvignon. I couldn’t wait to taste this eye-catcher for sure!! We decanted the Cab: Nice aromas of cherry, black berry and vanilla. On the palate I found it to be very fruit forward with cherry, blackberry, soft tannins and good acidity. The wine was quite velvety on the palate. Everyone enjoyed it! Oh, and the Pinot Grigio? It stayed in my Pastor’s refrigerator…a small gift of thanks for a wonderful feast, a memorable night with great friends and great wine!